The Vancouver chapter of Democrats Abroad has had an easier time getting people registered to vote this year – ahead of the upcoming U.S. midterm elections – than any other midterm in recent memory, according to people working with the group. 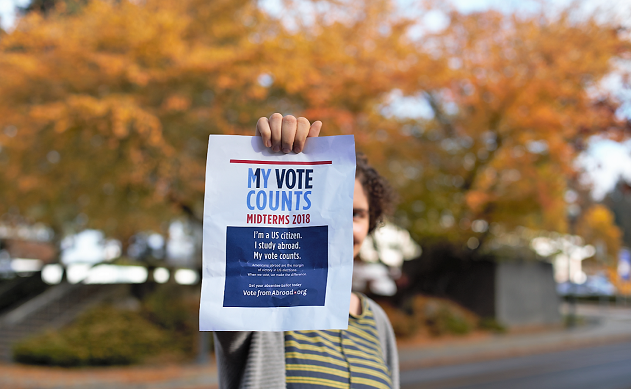 An eligible U.S. voter in the upcoming midterm elections holds up a Vote From Abroad leaflet at the University of B.C. campus. Californian expat Camille Mitchell, who has worked with the group on previous elections, has noticed an increased level of engagement from local Democrats. What’s exciting for her this time is that there’s been a lot of enthusiasm from people registered in traditionally conservative areas in the U.S.
Vancouver is home to the largest diaspora of eligible American voters in the world. Estimates put their count at over 180,000, meaning that a strong showing from local Democrats could have a significant effect on various races being fought in the U.S. House and Senate. 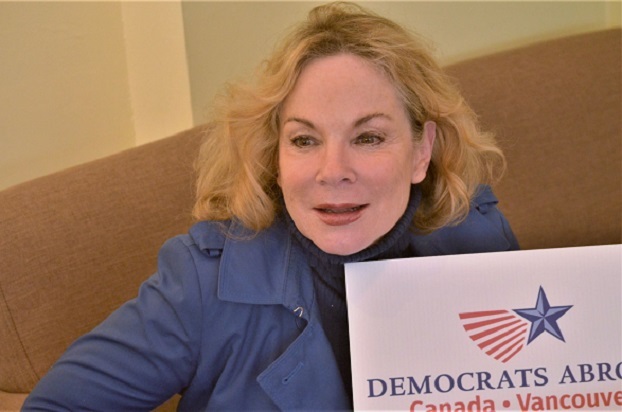 Camille Mitchell wields a Democrats Abroad poster in a Vancouver café. Democrats Abroad Vancouver has organized multiple events to get out the vote in recent months, including a protest in front of Trump tower in June. Still, they’ve found they don’t even need to promote particular policies or criticize the current administration to secure the public’s interest – they have it already. “I think the world is going to be holding its breath,” said Mitchell of the upcoming elections. Melek Ortabasi, a professor of world literature at Simon Fraser University who signed up to the Democrats Abroad after Trump was elected, joined because she felt that it was no longer fair to let the same old people shoulder the entire burden of activism. Even though engagement is up, however, the Vancouver Democrats Abroad worry that not enough people will take the time to vote. Some states accept registrations and ballots later than others, so the Democrats Abroad members said they encourage anyone with American citizenship to check www.FVAP.gov for the rules of their home state. They reiterated that they are always available to help people navigate this process, regardless of their political beliefs.